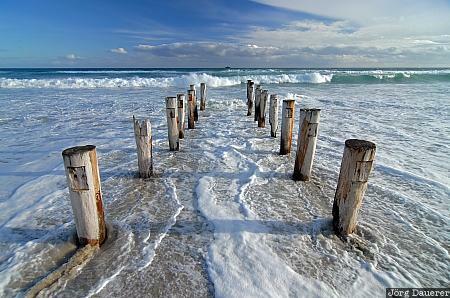 Rotten wood poles leading into the South Pacific Ocean at Saint Kilda Beach in Dunedin. Dunedin is in Otago on the south island of New Zealand. This photo was taken in the evening of a cloudy day in November of 2008. This photo is part of the exhibition The Beach (June 2015). This photo was taken with a digital camera.